Kathleen Casserly and her boyfriend, Jason, already had a 7-month-old puppy, Kirby, but they wanted to adopt another puppy. Though they live in Minnesota, they figured they could travel a bit to adopt just the right pet, so they logged onto Petfinder and entered their criteria: female, baby, Australian Cattle Dog, within 500 miles. Up popped Harley, a Cattle Dog/Pointer mix with, perhaps, a little Boxer thrown in. Harley stands proud with her people. “Exactly what we were looking for!” Kathleen says. “We applied and got her.” A week later they set out on the three-hour trip to Chasing Daylight Animal Shelter in Tomah, Wisconsin, which had listed the 8-week-old on Petfinder. The dog’s mother had been found running loose in traffic during one of the coldest winters on record shortly after giving birth to six puppies. 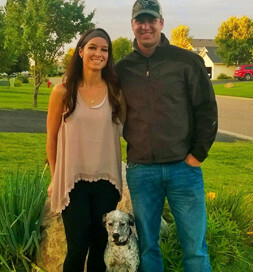 Kirby welcomed her, and this summer Harley had an opportunity to pass the welcome forward, serving as a “big sister” to the couple’s foster puppy, Blackie, from Luv Me Again, based in Bloomington, Minnesota.